First German settlement in Colorado County. Founded in 1837 by William Frels who immigrated to Texas in 1834 and fought for Independence, 1835-1836. Proposed site of Hermann University, first institution of highter learning sponsored by Germans. Chartered by the Republic of Texas in 1844, but never established. A celebration of considerable importance to Colorado County is scheduled to take place at Frelsburg next Sunday, observing the centennial of the founding of that town and in dedication of the marker placed by the Texas Centennial committee at that place. The celebration will take the form of an all day jubilee beginning with a parade through the business section. An address of welcome will open the celebration at 10:30 Sunday morning. A barbecue sausage dinner will be served at 11:30. Speaking will begin at 2:00 P. M., with Hon. Russel Wolters speaking in English, Hon. C. W. Schmidt in German and Hon. L. J. Sulak in Czech. Baca’s New Deal Brass Band will furnish music during the day, and a big dance will be given at night in the Heinsohn Hall. The proceeds will be used for the benefit of the local Lutheran and Catholic churches and of the beautification and upkeep of the marker. The town of Frelsburg is one of the historic and substantial communities in Colorado county. The town was established by Capt. William Frels in 1841. Capt. Frels was in the Texas army at the battle of San Jacinto, and when he returned he gave a plat of land for the townsite, school and churches. F. A. Zimmerscheidt was one of the earliest pioneers in the settlement of that town, and the Leyendeckers, Piepers and Yordts(sic) were among the earliest colonists. 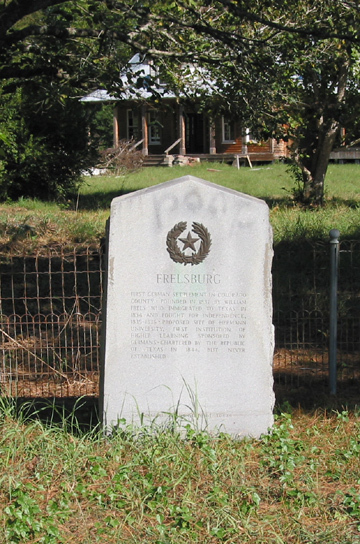 While not connected up in any way with the gaining of Texas independence, Frelsburg is a community typical of the hardy pioneering spirit that developed this country, and is today one of the thrifty, self-reliant, prosperous communities of the state and nation. Depression made its bitter attack upon that fair village, as it did every other town and hamlet in the nation, but there it was repulsed by citizens whose philosophy of life is to keep their desires within the bounds of their means, and with a smile of triump those people weathered the storm that wrecked many businesses, and homes over the land. The Frelsburg section boasts good schools, fine churches, an excellent trading center, and a citizenship of sturdy, industrious, home making farmers and stockmen who are independent of economic conditions outside their community to a surprising extent. On another page The Citizen is publishing a display space of congratulations and compliments to the Frelsburg people on the attainment of their 100th anniversary of their town, and the sentiment therein expressed is felt by the county at large, in hearty acknowledgment of this fine and splendid community in our county.